Rescue the Red-Eyed Tree Frogs! Diego and Alicia find out about tree frogs once Diego learns that there are tree frogs in trouble. Alicia figures out that they are Red-Eyed Tree Frog's, and Diego figures out that the wind blew the tree frogs off of their tree and they are going down the river. Alicia tries to find the tree fogs a new home while Diego and Baby Jaguar try to save them. Along their way, they face several new challenges, such as finding a way to get across a muddy pit, jumping over rolling coconuts, finding their way into a pyramid that the tree frogs went into, and finding their way through the pyramid to get to the tree frogs. Diego and a sloth, Sammy, try to save a mother sloth and her baby before a mudslide hits their tree. On the way they face several challenges. They must row across a rocky lake, tiptoe quietly around birds, and find the right path to go down. They also have to find an animal that can help them climb a rocky mountain. When Diego learns of a little chinchilla who got lost from her family, he helps the chinchilla to find her way home to Chinchilla Mountain to be reunited with her family. Along their way, they face new challenges! Some of those include choosing the right path with the wrong path being filled with snakes, and finding a way up Chinchilla Mountain to get the little chinchilla back with her family. When Diego learns that a baby humpback whale is in trouble, he takes off right away to save it. Along his way, he faces exciting new challenges. Some of those challenges include finding the right path to get to the whale, finding an animal to help him get around some jellyfish, and having to out swim sharks! The trouble doesn't stop there though, as Diego has to also figure out a way to get the baby humpback whale off of the beach and back into the ocean. Baby Jaguar is full of pride when he thinks that he is big enough to get to the top of Jaguar Mountain. Diego and Baby Jaguar's mother agree to meet him at the top of Jaguar Mountain. Does Baby Jaguar have the skills to make it up to the top, or will the obstacles prove to be too much trouble for him to handle? Diego and Alicia have been nursing three baby condors, but now it is time for them to get their own home! The condors are thrilled that they are being adopted, and they get a new mommy and daddy. But there is a problem, condors cannot fly at night. So the condors and Diego must hurry and get them home before nightfall. Diego and Alicia are far away from home! They are on a trip doing some research and animal help in Antarctica, and this trip proves to be a busy one! A little penguin, Pepito, is lost and cannot find his way to his new school. Diego must help him find where his new school is, and how to get there. An Armadillo wants to compete in the big Rainforest Race, but sadly, she cannot find a team to join. 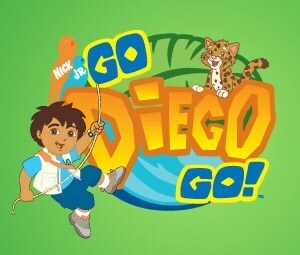 Diego decides that he will join her team, and together they participate in the games. A young Macaw and his baby egg brother or sister are in trouble! Their tucked safely into their nest, but their mommy is nowhere to be found. Diego goes on a search to find their mommy, and finds her stuck and unable to get out on her own. After he rescues her, he has to find a way to treat her so they can make their trip back to the nest before her little egg hatches. Diego and a Llama named Linda try to get to the Carnival in time so Linda can pull the float. But with all of the obstacles in their way, will they be able to get there before the Carnival is over? Baby Jaquar roars too loud and accidentally frightens a new baby blue moorpho butterfly away. Diego sets out to rescue him and bring him back home safely. A baby and father Pygmy Marmoset become trapped in a thorn bush and it's up to Diego and Alicia to get them out and find them the medicine they need to fix the cuts on their hands. Ana the Anaconda's home in the river dries up so Diego must help her swim to find a new home in another river with plenty of water. Diego's cousin Dora wonders upon two lost lost Spectacled Bears and calls Diego to help bring them back home safely. Alicia is opening a new library and it's up to Linda the Llama and Diego to bring her the new books. In this special two part episode, a Maiasaura duck-billed dinosaur has lost his way and it's up to Dora, Diego, Alicia and Baby Jaquar to travel to the Cretaceous period back in time to rescue him. In the conclusion of this special two-part episode, a Maiasaura duck-billed dinosaur has lost his way and it's up to Dora, Diego, Alicia and Baby Jaquar to travel to the Cretaceous period back in time to rescue him. Mommy Maned Wolf has lost her little wolf pup in the tall grass. She sets out in search of him with the help of Diego. Baby Jaguar is trying to get his animal-rescue patch, but first he has to rescue three more animals in trouble. The sea turtles need to lay their eggs but the beach is too dirty. Diego and Alicia need to clean it up before it's time to lay the eggs. Diego and Dora set out on a mission to help find the lost baby wolf pup bring him back to his mother. A baby river dolphin has become lost and needs Diego's help to get back to his mother in time to change color. King Humpback Whale's tail is stuck under a sunken ship in the sea. Diego and a baby humpback whale set out on a wild adventure to rescue him. A baby Kinkajou gets his head stuck in the bottom of a beehive while he is looking for honey. A newborn baby macaroni penguin has become separated from his family and it's up to Diego to help him find his way back home. Diego helps Iggy the Iguana find his way out of a cold and dark cave and back to his Iguana friends in time for the big Iguana sing along. Diego and Alicia set out in search of a new home for Panchita the prairie dog in this Old West-themed adventure. Linda the Llama and Diego set out to rescue Santa and his reindeer when his sleigh stacked high with toys gets stuck in the deep snow. The Bobo brothers are up to no good again when they capture baby jaguar's growl and seal it in a magical bottle. It's up to Diego to get his growl back for him. Diego, along with the aid of Baby Jaguar, Mommy Maned Wolf, Sammy the Sloth, Baby Humpback Whale, and Linda the Llama, help rescue Alicia and some injured penguins, who are stuck in the ice on a boat and need to be taken to the Snowy Rescue Center. Sammy the Sloth has a Valentine's Day gift for Lulu, but he needs Diego's help to deliver it to her. Diego and the Tapir travel by Chucho the Train to find the perfect environment for the Tapir to call home. Diego must build a bird plane so he can follow Jorge the Little Hawk as they set out in search of a warmer climate for him to live in. Before the volcanoes erupt, Diego and the Giant Octopus must come to the rescue of animals that have become trapped in coral caves. Roady the roadrunner is getting ready for his big race, but first he and Diego need to face many obstacles in the desert in order to make it to the race in time. Lucy the Fish has no idea what kind of fish she is, so it's up to Diego and Alicia to figure it out from certain clues and then help her find her way back to the proper home. Diego and a couple of red-eyed tree frogs must help reunite a howler monkey, a woodpecker, and three hummingbirds that were scared off by a loud puma while they were getting ready for their rain forest recital. While visiting Juma in Central Africa, Diego gets the opportunity to meet a baby gorilla who is to become the future King of the Mountain. All of the elephants in Africa have been turned into rocks by a magician's evil spell, and it's up Diego, Baby Jaguar and Alicia to break the spell by finding the magic drum. Diego and Alicia must save two baby otters that became separated when the Bobo brothers were messing around in the water and create a huge wave. Kyra the Crocodile is lost and Alicia must travel to the dirty city pond to help her find her way back home. Diego and Rhea rescue a nest full of baby cuckoo birds. Baby Jaguar makes a new friend. It's a baby duck named Willie. Willie won't go home so Baby Jaguar has to take him there so they can play on their way back. Kicho, Diego's musical friend who lives in the Andes Mountains, gets a visit from Diego. Diego and Porcupine Save the Pinata! The Bobo brothers attach too many balloons to the Porcupine's birthday pinata and it's up to Diego and Alicia to catch it before it floats away forever. Diego suggests that the Bobo brothers help out other animals in the jungle, so they will look like good monkeys for their Mother's Day. Diego, who has shrunken to bug size, helps a special bug make her way through the raindrop and spider webs in time for her to make it back to the beetle dance. Alicia and Whitetail, her deer friend, set out to rescue a fawn that has become trapped when there is a rockslide. First they have to get past the coyotes and down the mountain to help the baby fawn. A mountain begins to grow under the ocean floor, which causes mermaids to lose their city under the water. It's up to the manatee and Diego to help them before it's too late. Diego discovers that a flying squirrel needs help in rescuing baby birds. It's not just any flying squirrel though, this squirrel uses his super eyesight and super hearing to help find animals in need of rescue. Diego must rescue Luna the moon and place her back in the night sky so just-hatched baby sea turtles, which rely on the moonlight to guide them, can find their way to the ocean. Freddie the Fruit Bat Saves Halloween! The llama can't join Diego, Alicia, and the fruit bat for trick or treating because the bridge is broken. It's up to Diego and his friends to figure out a way to get the llama across the bridge.